I know I have turned into my mother when I am sneaking into the rooms where my children are sleeping to measure them for Halloween costumes. In Nate’s sleep, I fitted the elastic for his face mask, and double checked the length of his belt. In Alex’s sleep, I took hip and chest measurements to make sure I was cutting the right sized pattern. I also made a 3:30 am trip to Wal-Mart to secure a notion had forgotten to purchase earlier (for the record, skirt fasteners for Nate’s belt). This, of course, came on the heels of the 8 pm trip to Wal-Mart where I thought I had gotten everything I had forgotten two weeks earlier. And the drama of getting my sewing machine serviced on Thursday after it died on me Tuesday night, putting me far behind on costume making. I did not sleep last night. Why do I put myself through this torture each year rather than just plunking down bucks at Target? My son sitting upright in bed and exclaiming “I’m gonna have the power to READ!” The sound of my son saying “Mommy! You made it JUST RIGHT!” upon gleefully running out of his bed in the morning. The look on that adorable masked face. These things are worth every bit of stress. 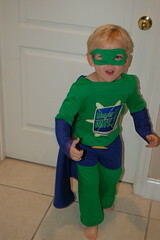 Superwhy! down, Luke Skywalker to go! LOL…I did so love trying to measure you in your sleep! And yes it was worth all the trouble and time, because to this day, you still remember how you felt when you saw your costume and you want to give that joy to your kids. the marvelous circle of life!